Welcome to enVision Environmental Education - manufacturer of Groundwater Flow Models (or Groundwater Simulators).ï¿¿ Our products are assembled of high quality acrylic and are designed with ease of use in mind.ï¿¿ We are proud to offer the best and most preferred model available--no other model demonstrates as many features. enVision models come fully assembled and ready to use. All enVision simulators include pumps to recirculate the water, wells, springs, artesian wells, a lake, a malfunctioning septic systems and leaking underground storage tank and allow dye injection to simulate groundwater or contaminant flow along with our standard accessories. They are great for demonstrations at fairs, museums, children's groundwater festivals, watershed days, classroom demonstration, wellhead or source water protection committees and more. 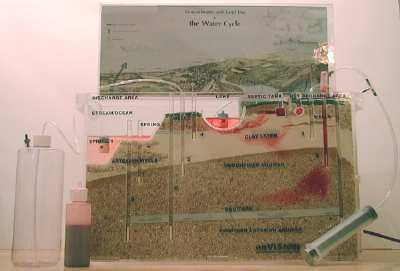 Groundwater models (also called groundwater simulators, groundwater flow models, sand tank models, aquifer simulators, aquarium models and groundwater demonstrators.) The EnVision simulator is an improved version of the simulator design originated by Richard Passero at Western Michigan University and the GEM Centers and was later sold by the Western Group, Fisher Scientific and Crystal Scientific of Kalamazoo, Michigan as the GWS III and GWS IV. EnVision groundwater models are the ONLY models manufactured with the permission and under the guidance of Richard Passero, who is now retired. EnVision provides a similar, but superior product to Crystal Scientific, but Envision is NOT associated with Crystal Scientific. The recirculating reservoir tank type system used in the EnVision model is superior to older simulator designs by Iowa State, University of Nebraska, Ward Scientific, NeoSci, Southern Illiniois University and the University of Wisconsin Stevens Point which can be difficult to use. The EnVision groundwater simulator is the preferred simulator design used by groups such as rural water association, state DEP and DEQ, retired senior environment corp (rsvp), environmental alliance for senior involvement (EASI), HomeGuard groups, watershed associations and wellhead and source water protection committees. If you are an educator, be sure to watch for the EnVision bedrock simulator in use by the American Groundwater Trust, AGWT, at their Groundwater Institute for Teachers. The EnVision model is a great compliment to Project WET, TAPwater by American Water Works Association, AWWA, Children's Groundwater Festivals, Hydromania and other groundwater education programs for wellhead and source water protection programs.